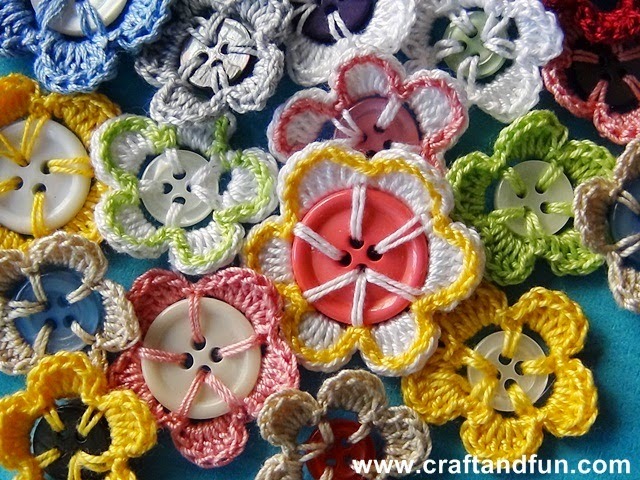 Copy this link: http://www.craftandfun.com/2014/09/riciclo-creativo-bottoni-idee-decorazioni-uncinetto.html#more and paste into the text box, choose English, and click Translate. 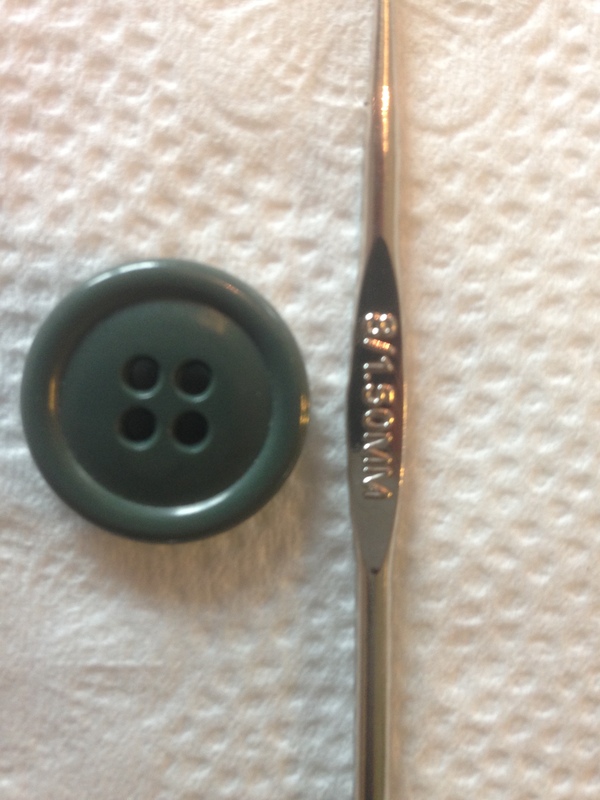 My example uses a ¾ inch button with 4 fairly large holes and a #8 (1.50 MM) steel crochet hook. 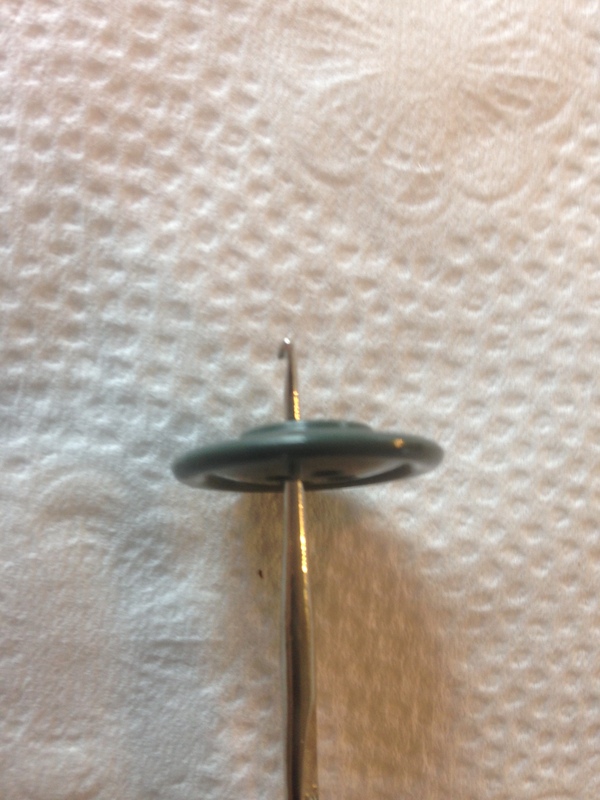 Make sure whatever size button hole you have that your crochet hook tip can pass through it easily. I also used #3 crochet thread. I also started using a pretty long tail. You can trim the tail at the end or use it to sew several of these together. I basically followed the directions as shown in the above link. I made minor adjustments as shown in the steps below. 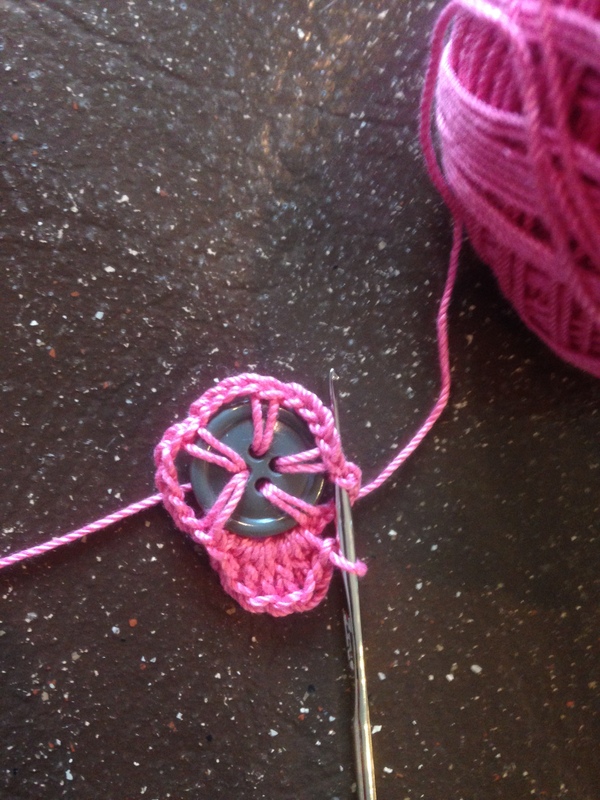 Step 1: Crocheting into the button holes – It might be tricky catching the thread. Just keep trying, you will finally get it. You might have to drop the thread and wrap it around your hook with your other hand to get it through. Make sure the loops aren’t twisted, pull tight and make sure you have 5 loops coming out of the 4 button holes. Step 2: Making the petals – In translating to English, I’m sure they are using English (UK) crochet stitches and when the English directions call for treble crochet, it usually means double crochet in American stitches. So, this is how I made each petal. 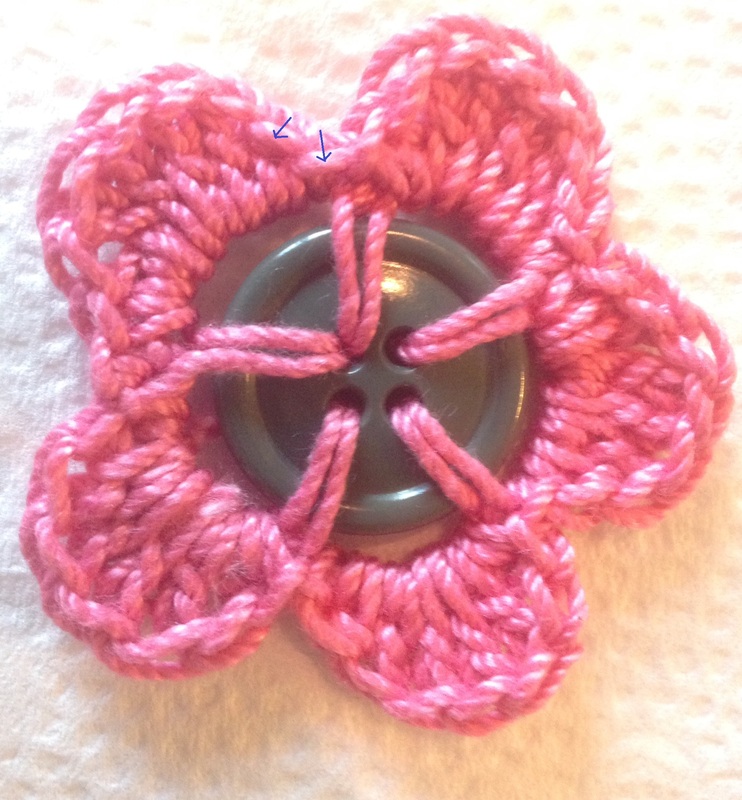 I crocheted very tight when making the petals. In each of the spaces created with the chain four between each button hole loop: 1 slip stitch, 1 half double crochet, 4 double crochet, 1 half double crochet and 1 slip stitch (total 7 stitches). (The translated directions mention 4 mesh high. I didn’t know what that meant so I just used 4 double crochet instead and it looks the same as their example.) I pushed each stitch to the right as I went so each stitch would lay flat. Step 3: Finishing – To finish, weave in the end as shown in the example. Weave in the beginning tail and make it secure. It can now be trimmed or use it to sew several together or sew it on something else. Contrasting Thread: The directions state you might want to crochet a contrasting thread around the low mesh of the flower. I would just crochet around the bottom loop of the loop created in each flower petal. See the stitches marked by the blue arrows. You would be working with one beginning loop and 7 petal loops.